Here you'll find a matching bedside table for many beds. Night tables are indispensable in the bedroom and it is best if they are matching with the bed. Nicely upholstered, just like the design beds or made of beech wood or wild oak wood, so that they fit the solid wooden beds and beamed beds. 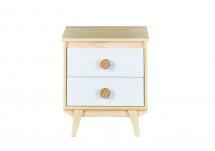 Also for the popular pine beds we have perfectly fitting bedside tables.